The Tofalars live in Irkutskaya Oblast (731 p.). The self-designation of the people is tubalar ~ tofalar. It is believed that the tribal name tuba ~ tuva refers to the Nenets clan of Tuba, and thus to the possible genetic origin of the Tofalars. At one time the Tofalars were widely known as the Karagas. It is assumed that their name (Kara-Kash), as well as their language, descends from the Kachins, i.e. Khakass. The Tofalar (or Tofa) language belongs to the Uighur-Oguz group of the Turkic languages, forming, together with the Tuvinian and ancient Uighur and Oguz languages, the subgroup of Uighur-Tki. Phonetical, grammatical and lexical characteristics show Tofalar as being most closely related to the Tuvinian language. Some academics believe that it is in fact a dialect of Tuvinian. The origin and history of the Tofalars has been poorly investigated. 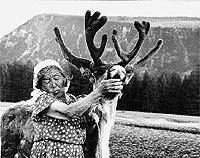 They have lived for centuries as nomads of the taiga, north of the Sayan Mountains. In the 18th century, P. S. Pallas and J. G. Georgi regarded the Karagas as a Samoyed people and later it was believed that they had adopted the Turkish-Tartar language learnt from the Tuvans in the 19th century. However, V. Rassadin established (1969) that the ancestors of the Tofalars must have been a Ket-speaking tribe, who in the 6th--8th centuries took the ancient Turkish language and adapted it to their own phonological system. Later there were other influences and they were joined by other tribes (Samoyeds, among others). For centuries Tofalars have lived as nomads. They have mostly had contacts with the eastern Tuvans. The two nations have much in common in their way of life and in their fate. However, the Tofalars were drawn into the Russian sphere of influence much earlier. In 1648, the Russians founded the fortified settlement of Udinsk and subsequently, the Tofalars became another people destined to appease the Russians' unquenchable appetite for furs. A fixed amount of sables was required as tribute per head of every gunbearer (aged 16--60), though often the quantities were arbitrarily increased. In 1889, for example, tribute was demanded for 248 gunners, although there were only 103 hunters. The man's, female and children's traditional clothes had no essential distinctions. Winter clothes produced mainly from skins of the lamb, maral and deer.